A team led by food science and human nutrition professor Zeynep Madak-Erdogan found that treating ovariectomized mice with a combination of conjugated estrogens and the drug bazedoxifene improved metabolism and prevented the weight gain often associated with low estrogen levels without posing increased risk to their reproductive tissues. CHAMPAIGN, Ill. — Treating ovariectomized mice with a combination of conjugated estrogens and the drug bazedoxifene triggers the expression of genes that improve metabolism and prevent weight gain – without stimulating the uterus and increasing risks of reproductive cancer, a new study suggests. 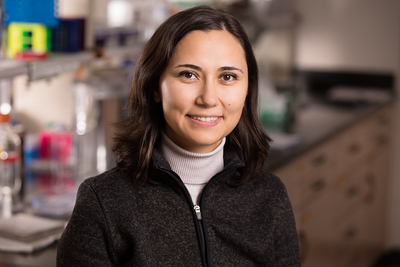 University of Illinois food science and human nutrition professor Zeynep Madak-Erdogan led a group of researchers who explored the effects of conjugated estrogens and bazedoxifene on the liver by analyzing gene transcription and the metabolism of about 150 chemicals in the blood. The findings were reported in a paper published in the online journal PLOS One. Bazedoxifene is commonly prescribed in combination with conjugated estrogens to prevent postmenopausal osteoporosis. It is among a class of compounds known as selective estrogen receptor modulators, which bind to estrogen receptors and either promote or block their activity. The scientists fed 48 eight-week-old mice a high-fat diet in which 45 percent of the calories came from fat. To mimic the low-estrogen state of menopause, 40 of the mice had their ovaries removed when they reached 10 weeks old. The mice then were randomly divided into five groups, each of which was treated for six weeks with a different combination of conjugated estrogens and bazedoxifene. The scientists measured the mice’s food intake and body weight weekly, and performed MRIs before treatment and at four weeks post-treatment to measure each animal’s whole body mass and lean body mass. After the treatment period, the scientists euthanized the mice and weighed their adipose (fat) tissue, including their white adipose tissue, which stores energy in the form of lipids; and their mesenteric and perirenal adipose tissues, two forms of abdominal fat associated with the development of type 2 diabetes, insulin resistance, inflammation and other obesity-related diseases. Using liver samples from each treatment group, the scientists examined the expression of various genes within the mice’s livers and measured the levels of nearly 150 metabolites in their blood, including cholesterol, free fatty acids and glucose. Treatment with bazedoxifene and conjugated estrogens decreased the expression of genes along three parallel metabolic pathways that affect liver health – reducing lipid accumulation, levels of inflammation and reactive oxygen species pathways in the liver, Madak-Erdogan said. The researchers found that eight metabolites associated with the weight and health of the liver were down-regulated by the estrogen supplements – including several metabolites known to be misregulated in people with nonalcoholic fatty liver disease. Recent studies suggesting that hormone replacement therapy increases women’s risks of reproductive cancers have prompted physicians to exercise caution in prescribing hormones – despite evidence that HRT may improve women’s metabolic functioning, lessen weight gain and lower their risks of serious health conditions such as cardiovascular disease and diabetes, Madak-Erdogan said. U. of I. graduate students Karen Lee Ann Chen and Brandi Smith contributed to the research and were co-authors of the paper, along with Illinois alumnus Yiru C. Zhao and Kadriye Hieronymi, who was a postdoctoral fellow at the university. The research was supported by grants from the U. of I. Office of the Vice Chancellor for Research, the Beckman Institute for Advanced Science and Technology, the U.S. Department of Agriculture National Institute of Food and Agriculture, and Pfizer Inc.
Editor’s notes: To reach Zeynep Madak-Erdogan, call 217-300-9063; email zmadake2@illinois.edu. The paper “Bazedoxifene and conjugated estrogen combination maintains metabolic homeostasis and benefits liver health” is available from PLOS One or the News Bureau.